(Newser) – The Northern lights are rarer now than they have been for at least a century, but some spectacular light shows are probably on the way, researchers say. The phenomenon, triggered by solar winds, usually follows an 11-year cycle, rising quickly to a maximum before tapering off to a minimum. But researchers say the minimum has been "going on and on and on" since 2008, the Telegraph reports. A research station near the North Pole which observed the blaze of light in the skies almost nightly during the cycle's peak saw it less than half the time this year. "We’re waiting to see what happens. Is the next maximum going to be on time, is it going to be late, is it going to be huge?" wondered a Finnish meteorologist. 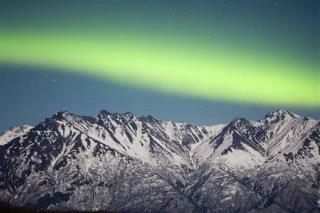 Scientists expect solar activity to soar in 2013, which would bring impressive shows from the Northern—and Southern—lights. Click here for that story. omg, it must be global warming!!!!!!! !